That's right, the Dream Team behind Hamlet Isn't Dead's Taming of the Shrew is together again for the One-Night-Only Spectacular that is "Peter! David Andrew Laws plays Peter Pan's father 'Pan', the Greek god of fertility. And shirtlessly at that. Robin Rightmyer plays Solomon, the stork-god emperor, and James, a young man who somehow grows up in the Neverland, with dangerous consequences. And Tiffany Abercrombie plays the mystical and Shakespearean Queen Mab and the ever-energetic Tiger Lily. Plus, Two Gentlemen of Verona's 'Lucetta', Emily C.A. Snyder, rounds out the production with her masterful directing. Though this will be presented as a Staged Reading, that's no reason to think the actors will be sitting behind music stands. With choreography both combative and romantic, shadow-play, and more, you'll quickly forget the scripts in hand and find yourself transported to a world before the Neverland. On this very special edition of Tales Told by a HIDiot, we sit down with author Kelly Feustel and director Emily C.A. Snyder and wax amazing on J. M. Berrie, Peter Pan, and the fantastic production you can ONLY see on Thursday May 22nd at 7pm. Come on down to Rusk Renovations, ring buzzer Number Three, and let us whisk you away to Neverland! For seat reservations, e-mail turntoflesh@gmail.com. 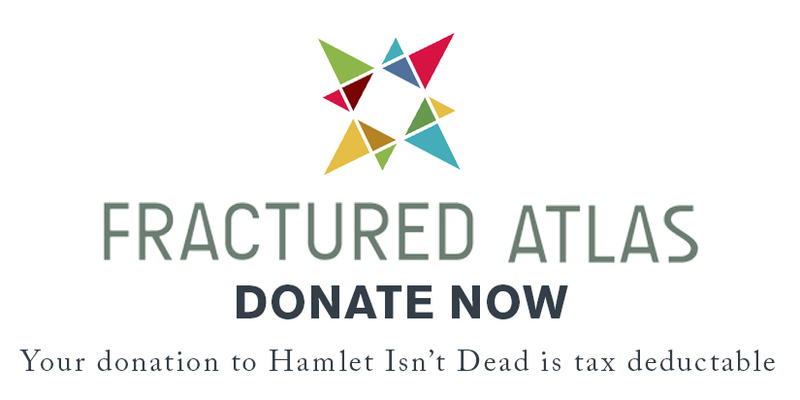 And tell 'em Hamlet Isn't Dead sent'cha! !